I was attacked once by a blue triggerfish in Safaga. It was completely my fault, though, as I followed it towards its nest on the sand. It bit my fin several times. 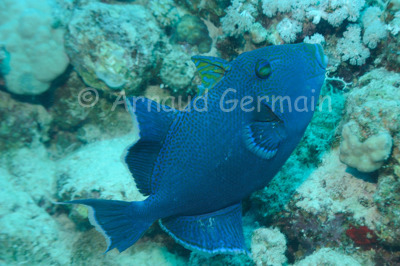 When I encounter blue triggerfish now, I am a bit more cautious. This one was having his breakfast during a very early morning dive and swam towards me. I took a few pictures without disturbing it! Nikon D700, Nikon 28-105 mm macro at 92mm, F9, 1/60th, ISO 400, Ikelite Housing and Ikelite DS160 strobe set on TTL.